We look forward to sharing our little piece of paradise with you soon! Follow the hearts from Jungutbatu or find us on the beach - 700m up from the boat arrival jetty. 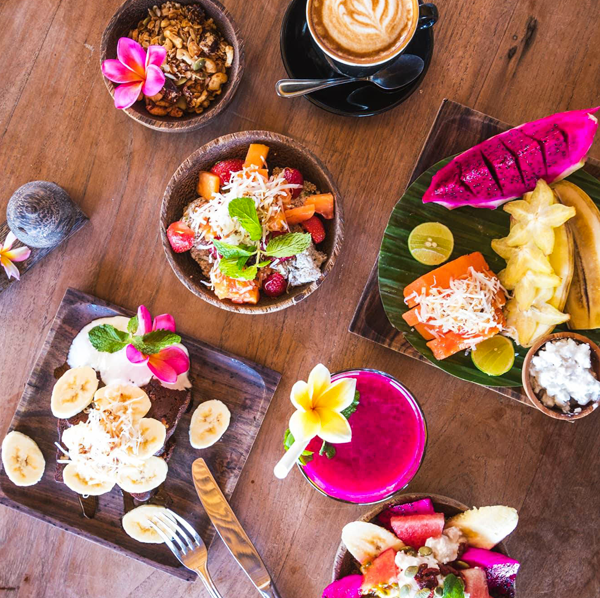 Created from a love of yoga, healthy eating, island living and good vibes; we have put heart, soul, hard-work and dreaming into creating this little piece of heaven on the beautiful island of Nusa Lembongan. We can’t wait to share this dream-come-true with you. 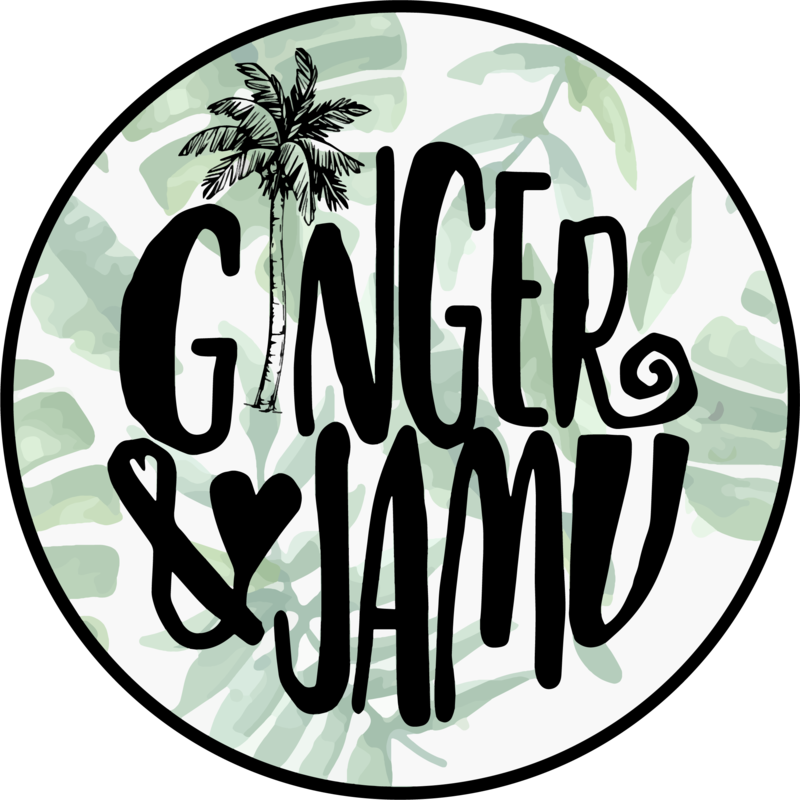 Ginger + Jamu is not just a cafe, we are a community and an experience…. from our heart to yours! We dedicate ourselves to serving only the freshest and highest quality ingredients we can. No nasty ingredients like msg or low quality oil, nor packaged food laced with chemicals and preservatives. It is all fresh and handmade with love. Our coffee is handpicked & organic from Indonesia and we work with top class trainers to educate our people and deliver the best coffee. All of our ingredients we source as locally, ethically and as high quality as possible. We are committed to operating in a way that prioritises freshness and naturalness for the benefit of you and our sweet Earth. Food made with love, to feed and nourish body and soul. Where fresh, ingredients, chilled vibes and innovative ideas meet. I LOVE Ginger & Jamu! Fresh, healthy, tasty food made with love. By far the best on the island. 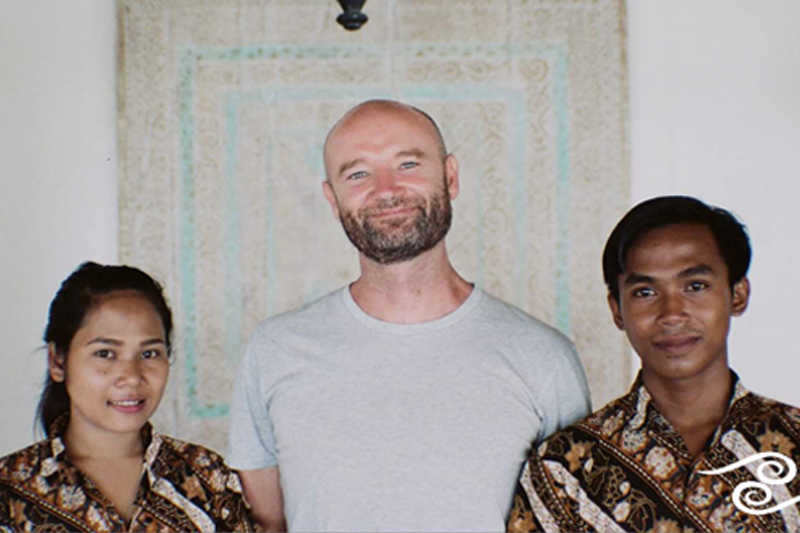 If you are ever in Nusa Lembongan make sure you visit Jamie & the crew & enjoy a beautiful meal & watch the sunset. 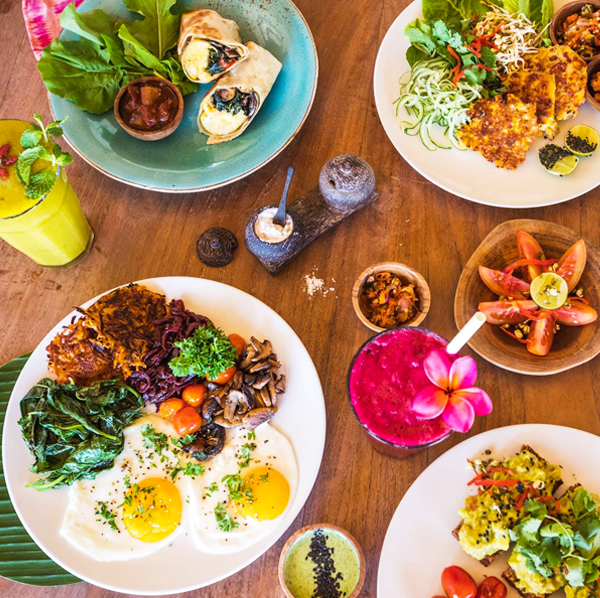 Gorgeous vibes, delicious clean food, beautiful authentic Yoga, excellent friendly local staff... this place is LOVE in every aspect. You will nourish your tummy, heart and soul here. We pretty much spent half of our days on the island in this place. It's pretty special: the food is amazing, great drinks and coffee, great location on the beach. The staff make you feel more like family or meeting up with your mates. Super chilled and cool. Thanks guys for having us we wish we were still there! Click here to download our Full Menu! House made satay sauce with grilled chicken breast, balinese sambal, baby romaine lettuce, cucumber noodles, shallots, sprouts and carrot. Great care goes into creating the most most-watering meals possible using the freshest ingredients. Our chef is a yogi and expert in nutrition – he knows exactly what our bodies need to keep them healthy, happy and radiant. 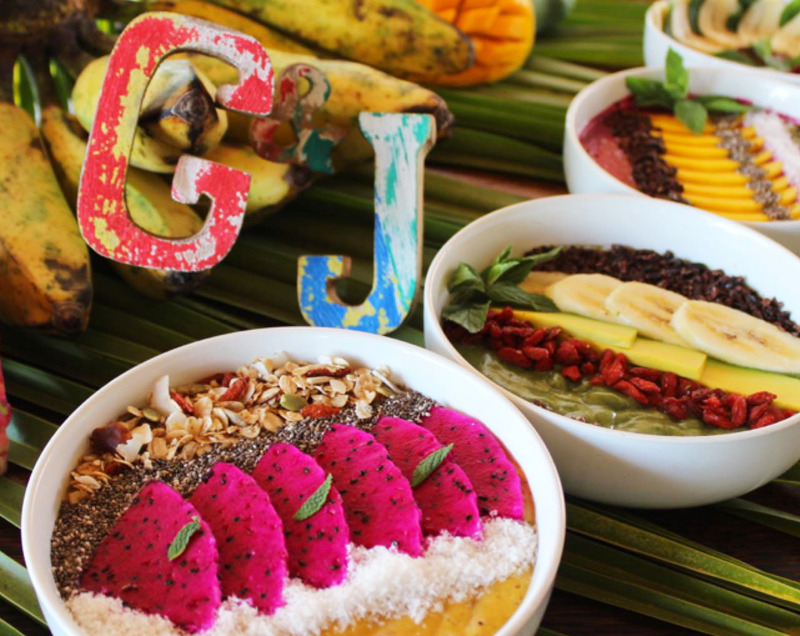 Ginger + Jamu café serves a selection of healthy, hearty meals, all created with the most important of ingredients... love! 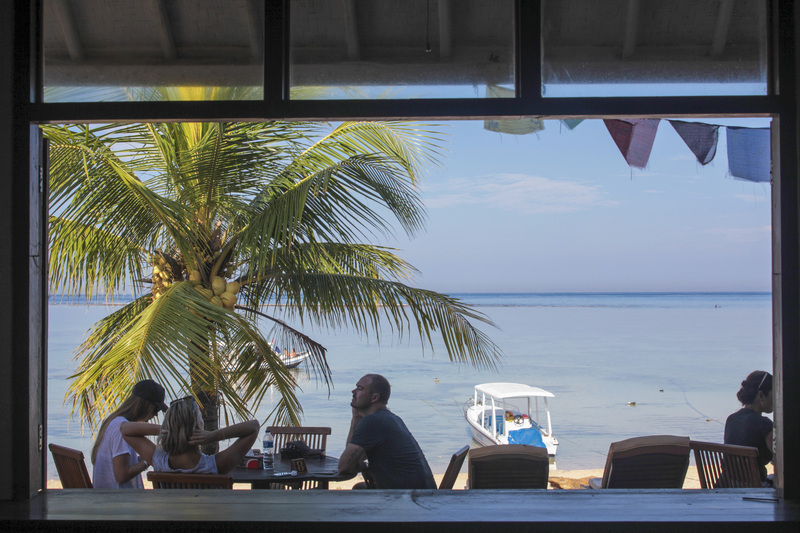 Join us for breakfast, lunch or dinner - or to watch the sunset with a cool drink and a smile on your face. As well as great food we LOVE great coffee - and we know the importance of good beans and trained baristas. 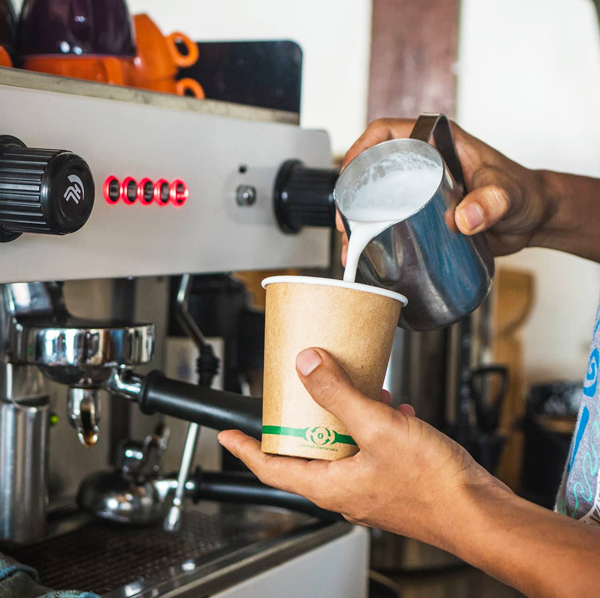 Your caffeine fix is in safe hands with us. We know your food restrictions don't go on holiday just because you do. 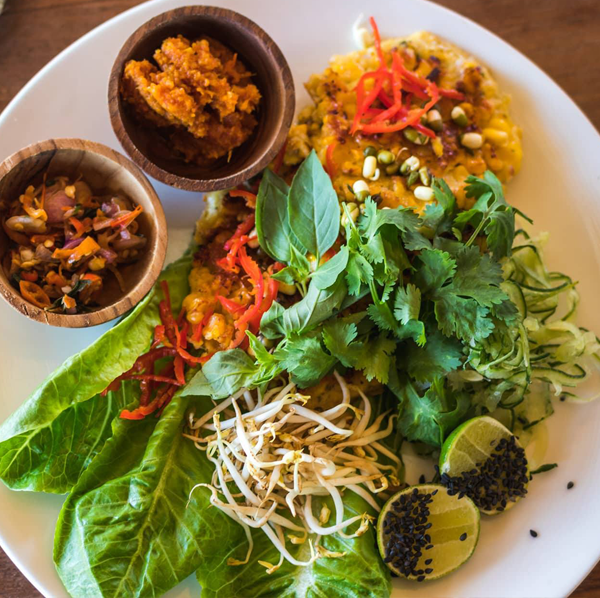 Vegetarian, vegan and gluten-free students will love the care and attention lavished on creating meals to suit all dietary needs. Start the day off right with our huge range of breakfast options. 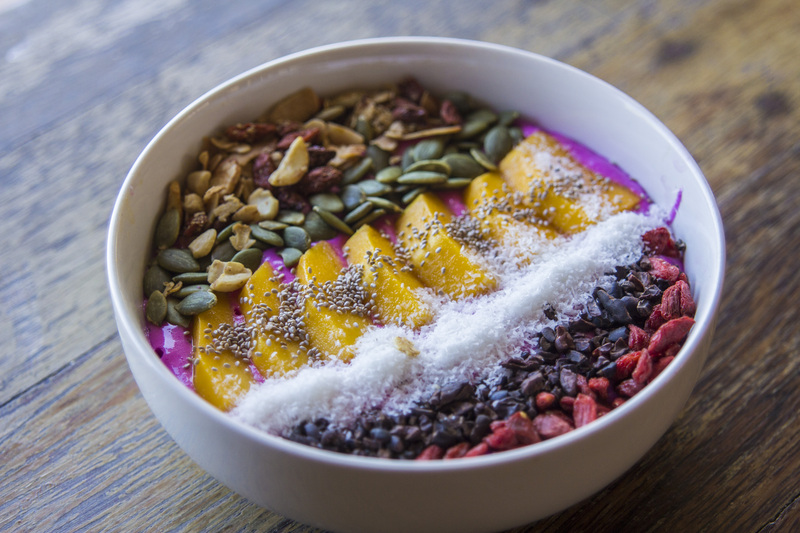 Go traditional with eggs and all the trimmings… or tropical with our popular breakfast bowls. At Ginger + Jamu we know the importance of a good coffee. That’s why we start with great beans, a great machine and the most important ingredient of all… a great barista! Choose from traditional espresso options – or get adventurous with our range of tumeric, chai and macha lattes. Our talented baristas are trained to create the perfect cup to please even the fussiest of caffeine aficionados. For those who prefer non-dairy, there are a range of alternate mylks to choose from. Best served with one of delicious vegan sweet treats on the side! All appetites are catered for in our delicious lunch and dinner menu. Whether you’re feeling peckish or after a hearty feast, our lunch and dinner options will leave you feeling fully satisfied. 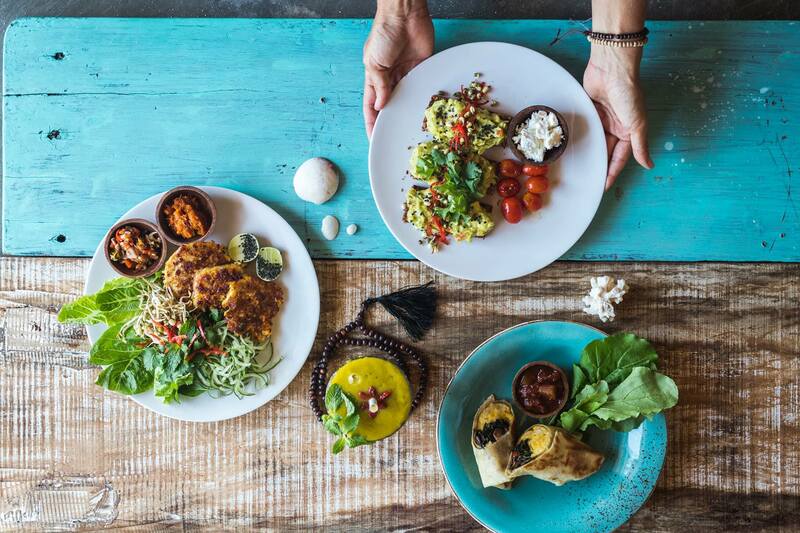 Choose from our extensive range of vegan or vege options – such as tacos, falafel and salads – or chow down on our famous Chicken Satay burger and a serve of fries. As always we make sure those with specific diet such as gluten allergies or other sensitivities can still enjoy dining with us. Please chat to the chef with your needs. 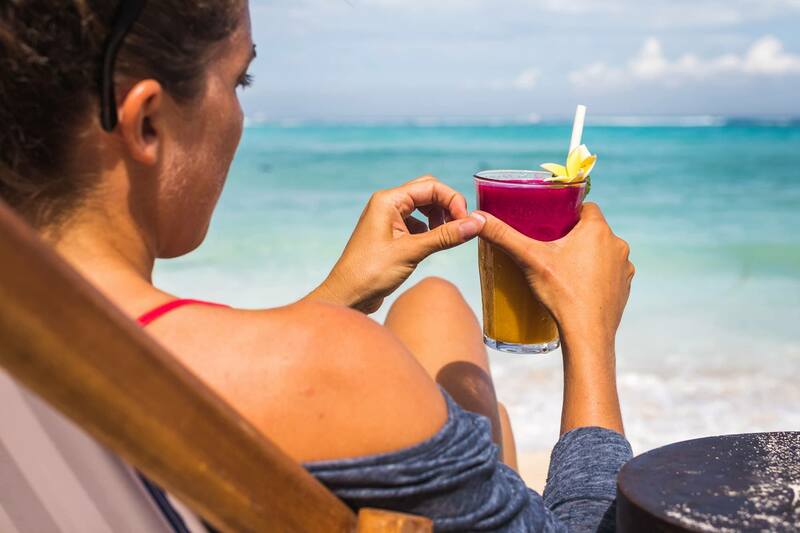 We have one of the best views in Bali – so sit down and soak it all in with a refreshing smoothie, juice or beer! 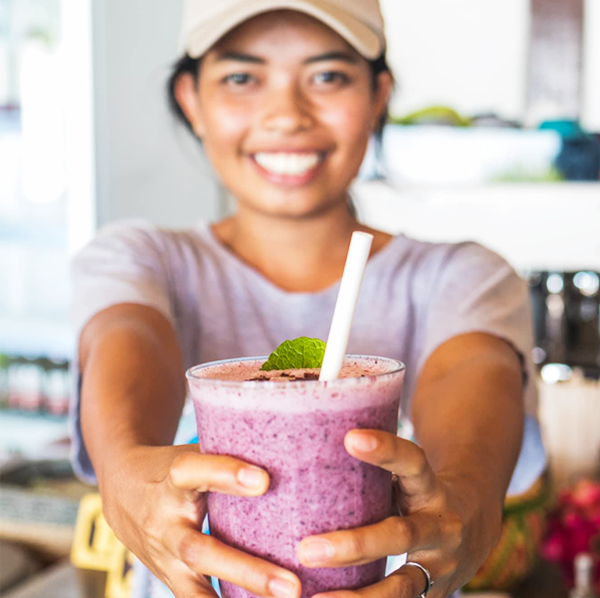 Choose from our menu of healthy elixirs designed to charge up your immunity and energy – including the legendary Indonesian tumeric Jamu – or tickle your taste-buds with a fresh and tasty smoothie or juice. We use fresh, local ingredients for ultimate health benefits and taste. For those wanting to soak up the sunset vibes with a drink in hand, we have the Bintangs and sangria ready and waiting for you. Chill with a drink while the sun sets over another day in paradise. Nothing says ‘tropical island holiday’ quite like sipping a drink while the sun slowly fades over the sea. Luckily for us we have the best seats for the show – and we’ve saved them just for you! 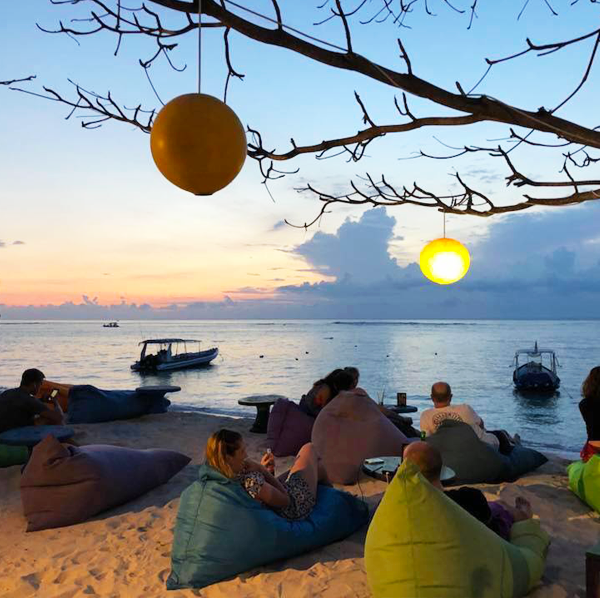 Relax on our beanbags by the shore and enjoy nature’s finest performance colour the sky. Best enjoyed with a Bintang, sangria or refreshing juice from our fresh juice collection. Vegans and vegetarians will be stoked to discover our extensive menu options just for them. Relax and enjoy your holiday knowing no animal has been harmed in the creation of your meal. Our chef and yogi Jamie is dedicated to providing a full spectrum of delicious options for those who prefer their meals cruelty-free. We know how to prepare vegan and vegetarian meals that are free of meat – but FULL of flavour – and look forward to sharing them with you.